Revolutionary ideas in luggage don't come along that often, but when they do, buyers delight in an "Ah-ha moment." Such was the reaction when we came across the Abrigo bag, created by Katie Grove. Described by Grove as "the world's only luxury coat bag," it is that, but so much more. Luxury - yes - no doubt. It's made of some of the finest jacquard material imported from Turkey, where weaving is a centuries old artform. Best part, this 19"x22" bag is made right here in America. When not holding your coat, its soft fabric drapes close to your body and never gets in the way. Sturdy - all seams are securely stiched and bode a long life, even in daily use. Rich leather reinforcement on the strap means even the heaviest load will travel safely. The leather also seems to keep the strap from twisting, whether worn over the shoulder or across the chest. Both zippers are surrounded by leather as well, protecting these vital parts of the bag. Practical - Grove designed the bag to store her bulky coat, both while in the airport and on the plane. A unique outside front pocket is designed to secure the bag over the handle of your suitcase. While it stores your coat with no effort at all, most people buying this bag are liable to want to use it everywhere they go instead of taking a large purse. When you're done, the bag can be folded flat for storage. Easy to get into the front pocket, this is a perfect place to store wallet, credit cards, etc. The large main compartment can handle just about anything else you could possibly carry. Also inside, you'll discover a key lanyard, solving the age-old problem..."now where did I put those keys." The Abrigo bag is presently available in two classic colors - Carmen Cognac and Carmen Verde. The fabric is so stylish, you're guaranteed to get compliments on its looks and its so versatile, you won't use it just for travel. 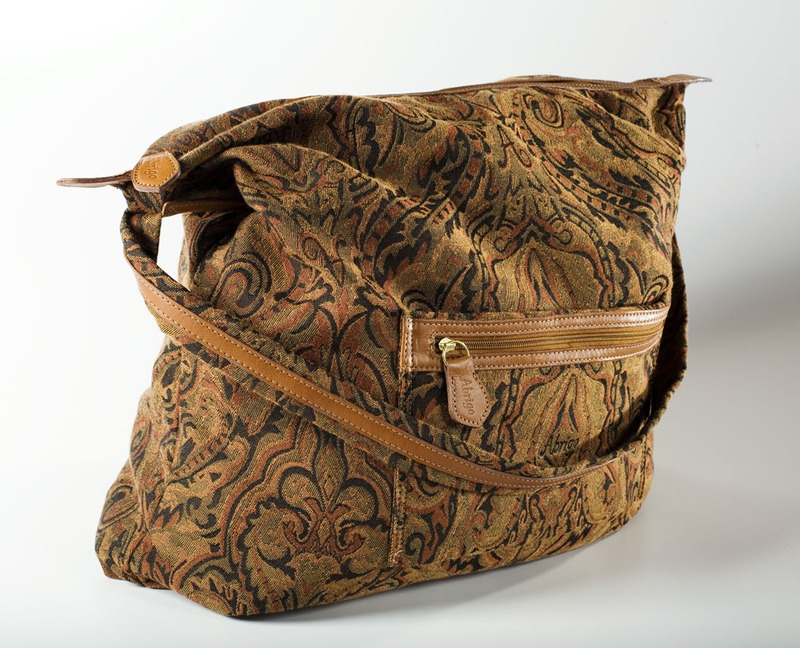 For more information, check their website at http://www.abrigobag.com.